It has been over a year since BDesh answered the call to help our Rohingya brothers and sisters. With your support we have made a difference. Imam Mohammad Magid recapped his personal experience from his last visit in the Rohingya Camp with BDesh. Dr. Ismail Mehr from IMANA Medical Relief reinforced the partnership between IMANA and BDesh Foundation. 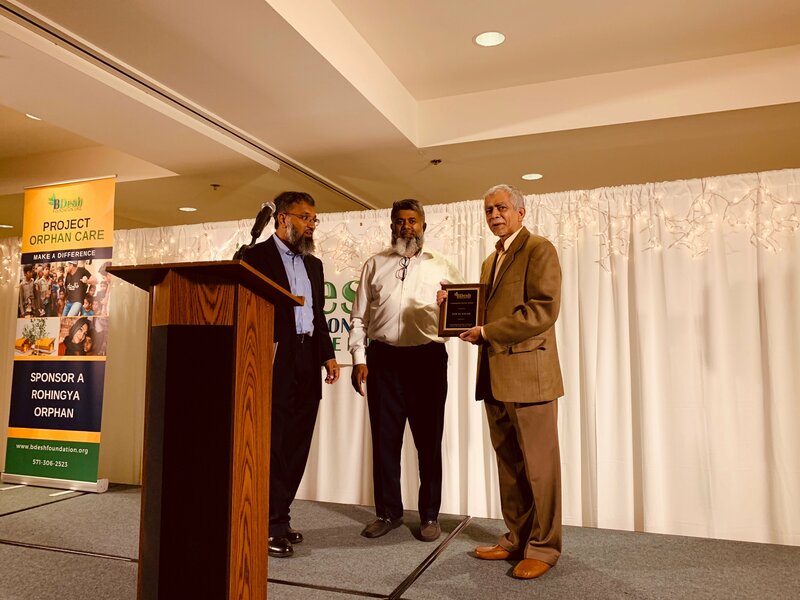 He highlighted the impact that both organizations are bringing together to provide medical service to thousands of Rohingya brothers and sisters. Dr. Imran Siddiqi served as the Master of Ceremonies. He emphasized the fact that despite all the atrocity Rohingya brothers and sisters have endured, they never lost their faith. Since September 2017, BDesh Foundation through its local partners has been assisting more than 150,000 Rohingya Refugees through BDesh’s clean water, sanitary latrine, shower facility program for women, health care support, food packages, Fitrana, and Qurbani Projects. Recently in September 2018, BDesh opened its first Orphan Care Center in the No Man Land area of the Balukhali Camp of Cox’s Bazaar. With Serve A Meal, your donations and volunteer hours have serviced fresh meals to thousands of homeless individuals in the Washington, DC area. Through Project Hasana, we have donated over 35 cars to local refugee and needy families in need of transportation for work, school and more. If we could summarize this year in one phrase it would be: “thank you”. This year would have not been a success without you because change doesn’t happen with one person. Change only takes place when a group of individuals come together for one purpose of making a difference.